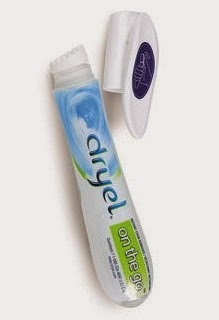 You can buy a Dryel pen like the one pictured above or you can purchase the Dryel home dry-cleaning kit which comes with a bottle of the stain remover. The stuff is MAGIC. It almost instantly removes every stain I've ever encountered. Additionally, it dries quickly and totally clear. So, follow Jennifer D'Alessandro's advice: Get some Dryel and carry it with you!